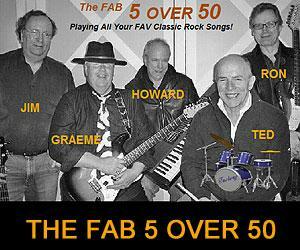 Classic rock band available for Private Parties, Weddings, Corporate & Community gigs. We play cover songs of all your fav groups from the 60's, 70's, 80's to current day. We play in the greater Vancouver area & our fee is reasonable and negotiable. HOW MANY DUDES IN THE BAND? : 5 at last count, 5 OVER 50 (DUH!)... but then again, there might be 50 of us; name is a bit confusing; then again, it might be 4 or might be 6.... depends on who shows up to play.... but who's counting. WHERE ARE YOU FROM? VANCOUVER, B.C., CANADA...we're Canadian, eh! HOW OLD ARE YOU? : Way the HELL over Fifty and counting... thanks for asking! WHAT KINDA MUSIC DO YOU PLAY? : Anything that ROCKS or is under a rock. We DON'T do Lounge Lizard, Hip Hop, Reggae or Headbanging crash-and-burn. We're talking CLASSIC ROCK, dudes & dudettes!.... cover songs of all your favourite groups from the 60's to current day. We might even get all shook up & sneak in an Elvis toon! ANY WOMEN IN THE BAND? : Not so far, except maybe our wives. Of course, always looking for some hot chicks that can sing & put out... I mean, put up with a bunch of old Rockers. If this sounds like you, pls leave us your number and send us a photo... we promise not to harass (NOT)! HOW LONG HAVE YOU BEEN PLAYING AS A BAND? : Too loooonnnggg! We're so long in the tooth, we're considering calling the Band ... SNAGGLEPUSS! HOW MUCH DO YOU CHARGE? : Depends on what the GIG is. We're all very wealthy, so we don't need the money...NOT! We've been known to be bribed to play by: all we can eat, free beer and wine & Timmy Ho's donunts so, play-fee is negotiable & very reasonable ... more play = more pay. Keep in mind, the word FREE is not part of our play-fee vocab. Give us a shout and tell us what you have in mind, make us an offer we can't refuse and we'll make it happen! DO YOU PLAY HOUSE & OR PRIVATE PARTIES? : YES we do!!! Just love them to death; consider them our fav gig & the more private, the better! We do Weddings, Corporate, Community, Birthdays, Anniversary, Going aways, Bon Voyages, Grads, Holidays (Xmas, New Years, Halloween), School Proms, etc... etc. Any party or celebration of life gig you can think of... we will play the venue. ARE YOU ANY GOOD? : DAMN RIGHT WE ARE, SKIPPY ! Best sounding Classic Rock band this side of the Milky Way... to infinity & beyond! Just ask us if you don't believe us! We faithfully play cover songs of the originals with a 5 OVER 50 twist.... close your eyes and you'll think we're The Beatles!....just kidding, think we're better! DO YOU PLAY OUT-OF-TOWN VENUES? By out-of-town, do you mean Hawaii?... yeah we DO Hawaii, if you pay the travel & put us up in a grass hut. "Mahalo nui loa and Aloha!" If you're talking Chilliwack... dude, it aint gonna happen. Greater VANCOUVER is our turf. Don't really do over-nighters (unless you're good lookin) or road-trips and definitely too lazy to do clubs or tours; been there, done that.